CONDEMNS BOKO HARAM’S ATTACK AGAINST CIVILLIANS , WHICH IS A WAR CRIME . THE ORGANIZATION APPEALS TO THE NIGERIAN AUTHORITIES TO PROVIDE IMMEDIATE HUMANITARIAN ASSISTANCE TO MORE THAN TEN THOUSANDS PEOPLE WHO HAVE BEEN DISPLACED. THE ORGANIZATION ALSO APPEALS TO UNITED NATIONS TO PROVIDE IMMEDIATE HUMANITARIAN ASSISTANCE TO ALL PEOPLE WHO HAVE BEEN DISPLACED. تدين منظمة التحالف الدولي لمناهضة الإفلات من العقاب - حقوق ، الهجوم الذي قام به بوكو حرام ضد المدنيين في نيجريا، وهي جريمة حرب كما تناشد المنظمة السلطات النيجيرية تقديم مساعدة إنسانية فورية لأكثر من عشرة آلاف شخص نازح وتناشد الدول المجاورة والامم المتحدة تقديم المساعدات اللازمة للنازحين . منظمة التحالف الدولي لمكافحة الإفلات من العقاب –حقوق ، امام المحكمة الجنائية الدولية في لاهاي، بتاريخ الرابع من شهر ديسمبر الحالي 2018 بشكوى جديدة ضدّ جرائم الحرب والجرائم ضدّ الانسانية وجرائم الابادة وجرائم الكراهية ، التي يرتكبها النظام السعودي وبعض دول الخليج وشخصيات اوروبيةقدمت وبريطانية في اليمن . اكد مسؤول بريطاني سابق على صلاحية المحكمة الجنائية الدولية لوجود عدد من مواطني الدول الموقّعة على نظام روما الأساسي للمحكمة الجنائية الدولية ، واكدت المنظمة على مسؤولية الادارة الاميركية في ظلّ صمت الحكومات العالمية ، وناشدت المنظمة الامم المتحدة والمنظمات الغير حكومية التي تلاحق قضايا حقوق الانسان التحرك من اجل انقاذ اطفال اليمن وشعبها من الجوع والموت باجراء ضغط على الادارة الاميركية والادارات الاوربية لوقف بيع السلاح الى الدول التي تشن حرب ابادة ضد الشعب اليمني . والجدير بالذكر انه وفي هذه الشكوى قد تم التركيز على اسماء وشخصيات عالمية ايضا بعد أنّ تبيّن بأن عدد من الشخصيات الاوروبية لاعب أساسي ومباشر في الجرائم الدولية . هذا وتتضمن الشكوى الأدلّة والمستندات القاطعة. وتتطرّق الشكوى أيضاً إلى استخدام السلطات السعودية والامارات للأسلحة المحرّمة دولياً التي تمدّها بها اميركا وغيرها من الدول الاوروبية . On December 4, 2018, the International Coalition Against Impunity - Rights, filed a new complaint against war crimes, crimes against humanity, genocide and hate crimes committed by the Saudi regime, some Gulf states and European and British personalities in Yemen. A former British official confirmed the validity of the International Criminal Court (ICC) for the presence of a number of citizens of countries signatories to the Rome Statute of the International Criminal Court. The organization stressed the responsibility of the US administration in the silence of world governments. The organization appealed to the United Nations and non-governmental organizations that pursue human rights issues to move for Save the children of Yemen and its people from hunger and death by exerting pressure on the US administration and the European administrations to stop selling arms to countries waging war of genocide against the Yemeni people. It should be noted that in this complaint has been focused on the names and personalities of the world also after it turned out that a number of European personalities is a key player in international crimes. The complaint includes conclusive evidence and documents. Le 4 décembre 2018, la Coalition internationale contre l'impunité - Droits, a déposé une nouvelle plainte pour crimes de guerre, crimes contre l'humanité, génocide et crimes de haine commis par le régime saoudien, certains États du Golfe et des personnalités européennes et britanniques au Yémen. Un ancien responsable britannique a confirmé la validité de la Cour pénale internationale (CPI) pour la présence de plusieurs citoyens des pays signataires du Statut de Rome de la Cour pénale internationale. L'organisation a souligné la responsabilité de l'administration américaine dans le silence des gouvernements mondiaux. L'organisation a lancé un appel aux Nations Unies et aux organisations non gouvernementales qui luttent pour la défense des droits de l'homme afin de sauver Save the children of Yémen et son peuple de la faim et de la mort en exerçant des pressions sur l'administration américaine et les administrations européennes pour qu'elles cessent de vendre des armes aux pays guerre de génocide contre le peuple yéménite. Il convient de noter que dans cette plainte a été centré sur les noms et les personnalités du monde également après qu'il s'est avéré qu'un certain nombre de personnalités européennes est un acteur clé des crimes internationaux. La plainte comprend des preuves concluantes et des documents. أدانت منظمة التحالف الدولي لمكافحة الافلات من العقاب - حقوق بشدة عملية اغتيال السفير الروسي أندريه كارلوف في انقرة على يد الارهابيين وبصورة وحشية واعتبرت ان هذا الامر يعتبر جريمة بشعة توجب الملاحقة كما صرحت رئيسة المنظمة الدولية المحامية مي الخنساء انها تعرب عن خالص تعازيها ومواساتها للرئيس البطل بوتين ولحكومة وشعب دولة روسيا الاتحادية واشادت المنظمة بدور وجهود الدولة الروسية الذي يستهدف دحر الإرهاب واجتثاثه من جذوره. and to the Government and people of the Russian Federation. ICAI-HOKOK- 2016 , put complaints before the International Criminal Court (Hague-based) to bring to justice the Saudi leaders and their partners and commander of the Saudi Air Force for the heinous crimes against humanity they perpetrated against the Yemeni elderly, children and women in a series of airstrikes against civilian targets in Yemen. The International Coalition against Impunity (HOKOK) believes in human rights around the world. It does not belong to any authority or state. As well, HOKOK has the courage to confront any international or official authority by disclosing the crimes committed by the latter. It is known by its independence and free positions apart from flattery. ICAI/HOKOK strives to achieve justice and equality all around the globe, wherever it may be, indifferent to any authority or public figures that are practicing injustice in any form. We believe that the guiding principles of the United Nations and the articles of International Law are the base, the catalyst, and the only hope to achieve our goals. The crimes against humanity, war crimes and genocide committed against Palestinians in Gaza on 10/12/2008 and registered under number OTP-CR-4425/08. In addition to three other complaints during the Cast Lead offense on the Gaza Strip. The genocide committed against Palestinians by Israel in 2014. The violations of human rights in Saudi Arabia. The crimes taking place in Bahrain against unarmed activists and civilians. Indicting Israel during the aftermath of the 2006 war on Lebanon. The crimes taking place in Syria. The complicity of Turkey in abducting the 11 Lebanese pilgrims. Turkey's support for terrorist groups. On July 18, 2014 a number of European lawyers, members of the International Coalition against Impunity (HOKOK) have moved to The Hague according to an appointment with the ICC Court in La Haye to lodge a complaint against the Zionist entity, members of its government and some of the Israeli military leaders, in addition to some of the British government members and the US President for committing genocide, crimes against humanity and war crimes against the Palestinian people in general and the people of Gaza in particular. The complaint refers to the Rome Statute of the International Criminal Court and the international conventions. It also stresses on the authority of the ICC Court to hear this case since it became unambiguous that Palestine is a State after passing Resolution no. 67/19 that recognizes Palestine as a State. Recognizing the jurisdiction of the International Criminal Court (ICC), the complaint refers as well to the declaration lodged, in 2009, by the Palestinian Minister of Justice asking the prosecutor of the Court to initiate the investigations against the Zionist criminals, to President Mahmoud Abbas’ statement in which he declared his intention to sue the Zionist entity before the International Criminal Court, and to the status of the United kingdom as a State Party to the Rome Statute of the International Criminal Court. ICAI/HOKOK has called on all local and international human rights’ organizations to defend the people of Gaza by filing more complaints before the International Criminal Court and other international courts having jurisdiction over such case. ICAI/HOKOK has also called on the united Nations and all medical humanitarian organizations, such as the“International Committee of the Red Cross” and “Doctors Without Borders” to move immediately to Gaza to do their humanitarian duty; otherwise they are accomplices in the crimes of murder and genocide committed in Gaza. The International Coalition against Impunity (HOKOK) condemns police torture of criminal suspects in China where some detainees have been forced to spend days shackled to “tiger chairs,” without sleeping and food so their limbs become swollen. We heard appalling stories of detainees being hung by the wrists, shackled for years, and terrorized by “cell bosses”, yet having no real means to hold their tormentors to account, noting that the Chinese rule prohibits the use of evidence directly obtained through torture. Therefore, HOKOK calls on the United Nations to move immediately to stop these legal violations against suspects. The International Coalition against Impunity (HOKOK) condemns the unnecessary, excessive, and even malicious force used against prisoners with mental disabilities by jail and prison staff throughout the United States. Correctional staff have deluged prisoners with painful chemical sprays, shocked them with powerful electric stun weapons, and strapped them for days in restraining chairs or beds. Staff has broken prisoners’ jaws, noses, ribs; left them with lacerations requiring stitches, second-degree burns, deep bruises, and damaged internal organs. In some cases, the force used has led to their death. ICAI/HOKOK notes that jails and prisons can be dangerous, damaging, and even deadly places for men and women with mental health problems. Force is used against prisoners even when, because of their illness, they cannot understand or comply with staff orders. ICAI/HOKOK denounces the Saudi Arabia-led coalition’s blockade of Yemen with the 10-country coalition, which has United States logistics and intelligence support which are keeping out fuel needed for the Yemeni population’s survival in violation of the laws of war. Yemen is in urgent need of fuel to power generators for hospitals overwhelmed with wounded from the fighting and to pump water to civilian residences. Therefore HOKOK calls on the competent authorities to act immediately and allow safe and speedy distribution of fuel supplies to the civilian population because the overall situation in Yemen is dire especially after most of Yemen’s airports and harbors are not open to civilian traffic. ICAI/HOKOK calls on Bahrain’s authorities to immediately release Nabeel Rajab, a prominent human rights activist who has been detained over tweets he posted that were deemed insulting to the Ministries of Interior and Defense. HOKOK considers that convicting Nabeel Rajab breaches justice, yet it is a further proof that respect for the right to freedom of expression in Bahrain is under attack. He is a prisoner of conscience and must be released immediately and the charges against him must be dropped. Bahrain government is prosecuting anyone merely for peacefully expressing their political views which is a clear form of repression and a blatant violation of their rights. The International Coalition against Impunity (HOKOK) condemns the murder of Press TV’s correspondent in Turkey, Serena Shim, in a suspicious car accident near the Turkey-Syria border just because she choose to report the truth as it is instead of the version proposed by the US and the West. HOKOK suspects the Turkish authorities were involved in her death, as she said that Turkish intelligence authorities had accused her of being a “spy” and that she was being closely followed, after she made reports on Turkey’s role in aiding ISIS terrorists and allowing them to freely cross into Syria. Serena had obtained stories of terrorists infiltrating into Syria through the Turkish border and images of terrorists crossing entering Syria in NGOs’ trucks, showing how Ankara collaborated with those terrorists (ISIS) and blocked Kurdish fighters from entering Kobane. HOKOK calls for a thorough investigation because Serena was assassinated by Erdogan’s regime which oppresses the Kurdish population and supports ISIS. ICAI/HOKOK deplores the grievous accidents that befell illegal migrants travelling to Europe in ships; as lately, nearly 850 migrants had perished in a ship capsizing this Sunday off the coast of Libya, in addition to the wreck of a ship carrying more than 300 migrants on Monday near Greek coasts. HOKOK considers that these accidents entertain doubts regarding the reason behind ships sinking and this unusual recurring tragedy that seems to aim at getting rid of these migrants by some countries unknown to us. Therefore, HOKOK calls on the United Nations to conduct the necessary investigations in this regard since it is abnormal that thousands of lives are threatened and such large boats drown once they reach a certain point in the sea. The International Coalition against Impunity (HOKOK) denounces the crimes and the deterioration of the situation in the Palestinian refugee camp of Yarmouk near the Syrian capital, Damascus, as intense clashes continue between Palestinian factions and the ISIL Takfiri terrorists who stormed the camp on April 1, in cooperation with al-Qaeda anf al-Nusra Front. HOKOK has called on concerned authorities to urgently exercise their authority and influence in order to end the fighting in Yarmouk for the sake of civilian lives and to alleviate human suffering. As well, the United Nations shall ensure that all civilians are protected in accordance with the UN charter and international law. The International Coalition against Impunity (HOKOK) denounces the Suicide bombing that targeted Yemen's Houthi group and an army camp killing at least 67 people, including children, and injuring at least 80 people, in two separate attacks on Thursday, hours after a political crisis forced the new prime minister to step down. The International Coalition against Impunity (HOKOK) condemns the terrorist practices of the Zionist troops and settlers who profane Islamic and Christian sanctities, including Al-Aqsa mosque on Wednesday October 8. HOKOK condemns as well the Arab and international silence that incite the Zionists to continue their abuses against the Palestinians without fearing any deterrent actions to prevent them from pursuing their crimes. HOKOK calls on the Arab people to stand by Palestinians to resist against Zionist practices that violate all international laws. Nigeria’s Boko Haram, or the “Group of the People of Sunna for Preaching and Jihad”, echoes the terrorist group ISIS by killing and slaughtering people in Nigeria, committing the most heinous massacres in the name of Islam. Recently, the Takfiri group Boko Haram committed a massacre in northeast Nigeria killing 68 people, many of them children. Thus, ICAI/HOKOK condemns in the strongest terms the terrorist attacks conducted by Boko Haram, and expresses its deep concern regarding the activities of the Islamist extremist group, especially the shocking suicide bombings across northern Nigeria. HOKOK calls on the security council to put an end for these terrorist groups to immediately and unequivocally cease all hostilities and all abuses of human rights and violations of international humanitarian law, particularly violence against civilian populations, notably women and children, demanding the immediate and unconditional release of all those abducted by the terrorist group. ICAI/HOKOK condemns the campaign planned by the Saudi Authorities since 2013 to detain and deport hundreds of thousands of migrants. Many of them experienced serious abuses during mass expulsions including detention, beating and deportation. Many arrived back in their countries destitute, unable to buy food or pay for transportation to their home areas, because Saudi officials arbitrarily confiscated their personal property. Therefore, Saudi Arabia should immediately halt mass expulsions, abolish the exit visa requirement to obtain permission from the employer to leave the country, sign and ratify the Refugee Convention, enact refugee law consistent with international standards and establish fair asylum procedures for foreign nationals who may be at risk of persecution in their home countries. It must also comply with international law, which requires treating migrants with dignity at all times and not returning anyone who would face a real risk of serious abuse on return. The International Coalition against Impunity (HOKOK) condemns the series of attacks committed by terrorist groups on Tuesday February 17. HOKOK denounces the murder of at least 10 Afghan policemen and injury of eight when four Taliban terrorists carried out a suicide bomb attack on the police headquarters in Puli Alam city, just south of Kabul. As well, HOKOK condemns another suicide attack claimed by the Pakistani Taliban linked to al-Qaeda, in front of the police headquarters in Lahore, the largest city in eastern Pakistan, where at least five were dead and 17 wounded. The organization also denounces the terrorist attack in Boulaaba in the governorate of Kasserine where four Tunisian police were killed. Due to the continuous massacres and crimes committed by the Kingdom of Bahrain and its terrorist regime which practices the worst kinds of detention, torture and murder as well as all the crimes witnessed by the peaceful people of Bahrain, especially that these crimes are classified under war crimes and crimes against humanity, and they are committed against a specific denomination to commit a genocide. The International Coalition against Impunity (HOKOK) has decided to make some active steps to help the Bahraini people and to show the world the brutality of the terrorist Bahraini regime. In this regard, HOKOK will travel this weekend to the United Nations in New York to participate in the first annual conference of non-governmental organizations. During this conference, held between January 24 and January 30, 2015, HOKOK will deliver a speech and call on putting an end to the massacres and crimes against the people of Bahrain and urge as well the countries and non-governmental organizations to participate in the conference and condemn the Bahraini regime. Moreover, ICAI/HOKOK that includes a large number of Human Rights activist lawyers of different nationalities will hold a large protest in Barcelona, on Saturday, March 21, 2015 at 12 noon in Catalonia Square. Images and movies will be displayed as a confirmation to the crimes and evidence to be provided by HOKOK to the competent international courts regarding the crimes committed by the King of Bahrain and a number of Bahraini officials with the complicity of a number of European and Arab officials against the defenseless people of Bahrain. HOKOK wishes that you support it and participate with it in this important event... Anyone wishing to participate in, or support this event, or inquire about anything, please contact us at: icaihokok1@gmail.com. The International Coalition against Impunity (HOKOK) denounces the oppression against protesters in the Bahraini capital al-Manama, leading to a number of injuries during the commemoration of the anniversary of the Bahraini revolution. As well, HOKOK condemns the arrest of activist Jalila as-Sayyed Amin by Bahraini regime forces in al-Sahla region after raiding her house while she was sleeping and forced her out of the house into an unknown area, in addition to raiding the house of another activist Mariam Sahwan after they messed up with her house stuff and broke the house doors. The International Coalition against Impunity (HOKOK) condemned the Lebanese police’s use of tear gas, rubber bullet, batons, water cannons and butts of rifles and fired live bullets into the air against protesters during the ongoing demonstrations in downtown Beirut. HOKOK has called on the Lebanese authorities to take immediate measures to ensure that there is no repeat of violence against protesters and to hold accountable perpetrators of violent attacks. HOKOK condemns as well beating journalists that are covering the protests in unlawful and indefensible attack on press freedom. The International Coalition against Impunity (HOKOK) condemns the Saudi authorities as warplanes are flattening residential areas and civilian infrastructures. The Saudi-US aggression continued its aerial attacks on Yemen by launching brutal air strikes in several provinces of the country which left score of innocent people killed. The Saudi-US war planes killed Tuesday night, on September 15 around 50 Yemenis by launching a number of air strikes over Al-Mahwit, Saada, Hajja and Thamar provinces, most of them women and children. The Saudi-led aggression has so far killed at least 5,862 Yemenis, including hundreds of women and children. ICAI/HOKOK condemns the security services’ use of excessive force against demonstrators in Beirut downtown. In fact, the people have the right to demonstrate against all kinds of corruption in the Lebanese government, starting with the essential human rights, such as providing electricity, water, medical care and education, to the spread of waste all over the Lebanese territories which cause serious diseases. HOKOK also strongly condemns the use of violence against journalists and photographers while covering this civilized popular and youth movement against the state’s policy that delays access to any satisfactory solutions regarding vital files. HOKOK also denounces the corruption that controls most of public departments and facilities by the complete coverage of the government, calling on the Lebanese who believe in their land, homeland and country's flag to go down to the street and speak out after this government became unbearable and the odor of corruption wafted up to it. ICAI/HOKOK strongly condemns the terrorist blast and atrocious crime committed by the coward ISIS terrorists in Jamila neighborhood in Baghdad, and calls on Iraqis to move forward in the defense of their right to life, and on security forces to protect civilians and pursue the terrorist gangs and bring them to justice. HOKOK appeals the international community and United Nations to make all efforts aiming to fight terrorism and eliminate it, asking God to grant mercy to martyrs and quick recovery to the wounded. The International Coalition against Impunity (HOKOK) condemns the killing of the Palestinian baby Ali Dawabsheh, 18 months, by burning him to death at the hands of settlers in the West Bank at dawn on Friday. Moreover, HOKOK strongly condemns this hate crime and the constant failure to end the state of impunity for acts of frequent violence committed by settlers. HOKOK calls for holding accountable the settlers responsible for the present crime, considering them barbaric and brutal action. In addition, HOKOK holds the Zionist occupation authorities responsible and calls on the international community to take necessary measures to protect the Palestinians from the aggressive practices committed by the Zionist settlers, and to provide security and protection for the Palestinian people. As well, it requests to bring the perpetrators and the Zionist officials before the International Criminal Court. ICAI/HOKOK denounces the Saudi regime's ongoing aggression and blockade of humanitarian aid against Yemen. As well, HOKOK considers that Riyadh’s relentless massacre of civilians in Yemen poses a security threat to the entire Middle East and hinders the resolution of the Arab country’s crisis. HOKOK calls on the UN Security Council to move immediately to stop the ongoing genocide and crisis in the Arabian Peninsula state, particularly that more than 3,000 people have been killed since the Saudi-US military campaign began on March 26 and more than 21.1 million people - over 80 percent of Yemen's population - need aid, with 13 million facing food shortages, while access to water has become difficult for 9.4 million people. Moreover, HOKOK denounces the Saudi warplanes’ airstrikes against Yarim District on Sunday morning, killing a total of 13 people, among them women and children, and injuring more than two dozen people in the attacks, and seven residential buildings were reduced to rubble. It also condemns Saudi Arabia for bombarding a number of houses in the Monabbih district of Yemen’s mountainous northwestern province of Sa’ada, leaving 19 people martyred and several others injured. ICAI/HOKOK condemns and rejects the terrorist and bloody Saudi aggression that commits bloody and barbarian massacres against Yemen, its land and people. These crimes did not exclude women, children, civilians, schools, hospitals, residential areas, roads, bridges, ports, airports, factories and transportation. Moreover, HOKOK stresses that these Saudi crimes of killing and destroying Yemen, as well as using internationally prohibited weapons, violate the international legislation and the Charter of the United Nations since they are considered as crimes against humanity, war crimes and genocide. It also emphasizes that this embodies the malice and hatred of Saudi regime towards Yemeni people and Yemen in general, and the desire to kill and destroy everything, in addition to the bloodthirstiness and criminality of this regime and carelessness towards religion provisions, international humanitarian law and the rights of neighbors. HOKOK emphasizes that it documents these crimes to be attached to the complaint submitted by it before the International Criminal Court against the Saudi aggression, calling on the peoples of the whole world to support the Yemeni people and to hold protests in streets to reject this aggression and to make pressure on governments to stop the crimes and massacres committed against the Yemeni people. ICAI/HOKOK strongly denounces the brutal crimes and crimes against humanity carried out by ISIS gangs against Iraqi citizens, employing the most heinous methods of murdering. ISIS persecution and systematic violations amount to crimes against humanity and war crimes under international law. HOKOK also denounces the absolute silence about these crimes by some mass media and the international organizations, what drives the criminal gangs to persist on their criminality and brutality. In this context, HOKOK demands the perpetrators be brought to justice. ICAI/HOKOK condemns the sentence of four-year imprisonment against Sheikh Ali Al Salman. It calls to reconsider this decision which will breach Bahraini people’s rights and will leave no room for any understanding between the people and the government. HOKOK finds that Bahraini authorities must be more understanding towards its people and give them all their rights, especially the right to freedom of opinion and expression stipulated in Article 19 of the Universal Declaration of Human Rights: “Everyone has the right to freedom of opinion and expression; this right includes freedom to hold opinions without interference and to seek, receive and impart information and ideas through any media and regardless of frontiers”. ICAI/HOKOK condemns the two suicide car bombings, in Iraq on Wednesday, which targeted police, killing 18 people and injuring at least 32, by the so-called 'Islamic State of Iraq and the Levant' (ISIL) takfiri group. The International Coalition against Impunity (HOKOK) denounces the gruesome massacre committed by takfiri terrorists from al-Qaeda-linked al-Nusra Front in Syria, against innocent Druze locals of Qalb Lawze village in Idleb Province countryside. HOKOK argued that this massacre is a blatant aggression against the Syrian people and reveals the barbarity of these terrorist organizations that violated all sanctities, regardless human considerations. HOKOK offers its deepest condolences to the martyrs’ families, calling on the international community to unite for fighting the terrorism that targets everyone, without exception. The International Coalition against Impunity (HOKOK) denounces the terrorist rocket attacks that hit residential areas in the northern city of Aleppo. Twelve civilians were killed and 15 others were injured on Sunday, May 31, most of them were children and women. The terrorist attacks also caused a huge material damage in the public and private properties. HOKOK urges the international community to put an end to these horrific massacres committed by the terrorist groups in Syria; particularly, IS and Jabhat el-Nusra. The International Coalition against Impunity (HOKOK) strongly condemns the criminal attack by Tafkiris on Imam Ali (A.S) mosque in Qadih town in al-Qatif, east of Saudi Arabia, which led to the injury and martyrdom of many people. HOKOK hopes again that these terrorist murderers would be dealt with strictly by the United Nations, and asks Allah to have mercy on the honorable martyrs, to grant patience to their relatives and to give health to the wounded. As well, HOKOK calls on closing ranks to fight terrorism, which threatens the region’s security, safety and stability, until it is finally eradicated. ICAI/HOKOK condemns Israeli soldiers’ violations against Palestinians in the occupied West Bank and Gaza Strip; firing tear gas, rubber and live bullets at them and wounding at least 21 people. As well, a Palestinian was martyred by the Israeli police in east occupied Jerusalem on Wednesday, May 20, after clashes took place near Ramallah and Nablus. In Gaza, which is still recovering nine months after last summer's devastating Israeli war, Zionist troops on the border fired live rounds at Nakba Day protesters, wounding four. In fact, after the Zionist entity's establishment in 1948, more than 760,000 Palestinians, estimated today to number around 5.5 million with their descendants, were violently expelled from their homes, with the catastrophe marked every May 15. The International Coalition against Impunity (HOKOK) has sent a letter to the Secretary-General of the United Nations, Mr. Ban Ki-moon, urging him to put pressure on Turkish and Qatari governments to release the Lebanese soldiers kidnapped in Arsal, as all the investigations carried out by HOKOK’s specialists have revealed the complicity of Turkey and Qatar in a direct way and with the help of Lebanese MPs and ministers as well as individuals in Arsal, aiming at inciting sectarian strife and helping the IS to maintain control over Lebanon. HOKOK considers that Turkey and Qatar declaration of their intention to combat terrorism is just a ridiculous play, especially that IS members are moving easily in Turkey, and financial support comes directly from Qatar so far. In addition, HOKOK warns of playing with the Lebanese hostages’ nerves. Therefore, the international human rights organization "HOKOK" will travel to the European Court of Human Rights in Strasbourg to submit a new complaint against Turkey being among the signatories to the European Convention on Human Rights. As well, HOKOK will prosecute all accomplices in the terrorist crimes against innocent people. The International Coalition against Impunity (HOKOK) condemns the death of at least 25 people and injury of 103 in the past eight days of fighting between pro-government forces and Islamist groups in the city of Benghazi. HOKOK calls on the UN Secretary General to act immediately to prevent these massacres in Libya they bring the death toll to around 475 since the army and forces led by former general Khalifa Haftar started a campaign against militants in the port city in mid-October 2014. The International Coalition against Impunity (HOKOK) strongly condemns the deadly bombings in Iraq, particularly the last suicide bombing, today, on Wednesday 24/12/2014 in Mada'en in southeastern Baghdad, committed by the terrorist ISIL, killing and injuring dozens. HOKOK expresses sympathy with the families of the victims and calls on the international community to take a firm stance with regard to the wave of terrorist attacks in Iraqi cities. The International Coalition against Impunity (HOKOK) condemns the ongoing unlawful attacks on civilians by car and suicide bombs in Iraq. It denounces as well targeting Erbil’s governorate building that killed at least 10 civilians and wounded dozens more, and the attacks in Baghdad that killed or wounded dozens. As to HOKOK, the brutal killings across Iraq underscore the need to protect all civilians, especially those fleeing violence and an effective response should end impunity for abuses by the terrorist ISIS. The International Coalition against Impunity denounces the hanging of 32-year-old Yousef Hassan al-Ramouni who was driving back home from work last Sunday when he was abducted and then hanged by Zionists in his bus in the Ras al-Amud neighborhood of East al-Quds. Moreover, ICAI/HOKOK demands an end to the ongoing incursions into Al-Aqsa Mosque and the provocative acts by Zionist settlers. As well, HOKOK demands an end to the Zionist occupation that keeps on killing innocent people, destructing their homes, stealing Palestinian people's land and resources and violating their human rights. The International Coalition against Impunity (HOKOK) condemns what happened in Tripoli recently and caused the death of Lebanese soldiers and civilians in ongoing battles in Tripoli in north Lebanon between the Lebanese army and terrorist groups. ICAI/HIOKOK calls on Lebanese citizens to support the army in these difficult times. As well, it urges the Lebanese government to act immediately to eradicate these terrorists from the government first, and then from Lebanon by providing support to the Lebanese army, the protector of homeland and citizens. The International Coalition against Impunity (HOKOK) strongly condemns the deadly bombings against pilgrims in the holy Iraqi city of Karbala, particularly the last explosion yesterday that killed at least 36 people and injured at least 53. HOKOK expresses sympathy with the families of the victims and called on the international community to take a firm stance with regard to the fresh wave of terrorist attacks in Iraqi cities. ICAI/HOKOK condemns the Turkish authorities for putting people on trial for insulting public officials. Over the past few months, a Turkish court has ordered to place Umut Kılıç, 24, in pretrial detention without any good reason, facing charges of defaming the president. Turkish government figures regularly contend that insulting words are not free speech. HOKOK have repeatedly criticized this position and Turkey’s regular restriction of freedom of expression, noting that the European Court of Human Rights (ECHR) has repeatedly issued rulings on Turkey, finding violations of freedom of expression. HOKOK calls on the Turkish authorities to protect free speech in line with international standards and to stop misrepresenting ECHR case law. ICAI/HOKOK condemns Manama authorities’ violations during April, where they arrested twenty-five civilians, including three children, raided seventy-two houses at night and quashed fifty peaceful marches from various regions calling for democracy, by shooting them. HOKOK calls on the Bahraini authorities to stop arbitrary arrests’ policy and to avoid the security option against activists and legal scholars claiming Bahraini people’s right in freedom, democracy and self-determination. The International Coalition against Impunity (HOKOK) denounces the extension of the Secretary General of Al-Wefaq Islamic Association, Sheikh Ali Salman’s arrest, by the Bahraini regime authorities, after the court extended his detention till the twentieth of May, only because he had practiced his right to freedom of expression. HOKOK considers that his detention is meant to stifle free speech and political freedoms in Bahrain, as Sheikh Salman had constantly called for dialogue and peaceful procedures. Therefore, ICAI warns that the extension of the opposition leader’s arrest is a dangerous escalation, calling on the peoples of Bahrain and the Arab world to hold peaceful demonstrations to condemn his detention and to support all his rightful and human positions. As well, HOKOK calls for the immediate release of Sheikh Salman and all opposition leaders who have been detained for the peaceful expression of their position. Sheikh Salman is a prisoner of conscience and must be released immediately after dropping charges against him. Bahrain government is prosecuting everybody for just peacefully expressing their political views; a clear form of repression and a blatant violation of citizens’ rights. The International Coalition against Impunity (HOKOK) denounces the continuance of the Saudi-US- Zionist aggression against Yemen that targets innocent civilians in their homes, and the massacres committed by hostile aircrafts against homes killing women and children, especially that fighting and violence in Yemen since March 19, has led to the murder of around 600 people and injury of two thousand others. 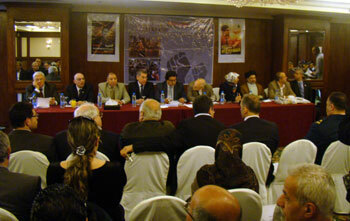 The International Coalition Against Impunity "ICAI/HOKOK", held a press conference on April 2012 to cover the disregarded human rights violations and negligence, along with other unsolved cases. In presence of lawyers and prominent law figures, Head of ICAI, Lawyer May al-Khansa called for the meeting in good faith to shed the light on this issue. On his part, Head of the Arab Bar Union Lawyer, Omar Zein, asserted that the time has come where the international community should stand against the injustice witnessed in the world. "We should struggle to free and defend the Arab lands. The struggle should be set against Zionism, which aims to divide the Arab countries, as it succeeded in Sudan," he added. He further urged unity between the Arab and International communities, to confirm a united stance in favor of the Arab world. Moreover, Head of the Lebanese Association for the Detainees and Freed Detainees Atallah Hammoud, praised the conference held in Lebanon, and noted the daily "Israeli" human rights violations in the occupied Palestinian territories. "Among the human rights violations are the practices against Iraqi, Afghan, and Palestinian prisoners, in addition to the unsolved cases of thousands of injured and missing people as a result of the occupations in Lebanon, Iraq and Afghanistan," Atallah Hamoud said. He urged that these issues be directly followed up in international courts so that the truth would be revealed. On his part, Spanish Lawyer Gracia, also member of the ICAI, asserted that Lebanon respects international legitimacy, hoping that the rest of the world would be as such committed to implementing human rights laws. He indicated that ICAI has filed lawsuits in international courts, to help boost human rights, especially after Lebanon's July 2006 war and the current crisis in Bahrain. "We hope that the International Criminal Court prosecutes the criminals; which is not a political role, it is only a legal role to implement laws," the Spanish lawyer added. Among the figures present at the conference were Iraqi activist Montazar al-Zaidi, who highlighted the devastating human rights violations which had occurred in his country. On another hand, representative of the UN Human Rights Commission Ambassador Haitham abou Saeed was also present at the conference, and stressed the importance of taking all human rights violations' file to international courts. He furthermore added that human rights organizations of all countries should file recommendations to their parliaments so that lawsuits should be taken more seriously. Lawyer May al-Khansa on the lawsuit filed against the "Israeli" aggressions, revealed that there is a decision to prosecute all those responsible for the massacres occurred by the "Israeli" enemy in Palestine and Lebanon. "However, [José Luis Moreno] Ocampo [Prosecutor of the International Criminal Court (ICC)] wouldn't sign the decision for it to be implemented," al-Khansa added. "Now, Ocampo promised he will be announcing the start of investigations," she added. "Next month, an ICAI delegation will visit the ICC to directly look into the fate of our lawsuits, as no response has been delivered to us," al-Khansa further regarded. The conference ended with hopes that it would be a "new start" to effective moves towards respecting human rights against the US-Zionist hegemony. From the Far East, Director of Political Section in the Chinese Embassy in Lebanon Pang Jianhao, was also present at the conference to show solidarity with the human rights movements. "In my personal opinion, while participating in this conference, I heard many speeches regarding what has happened in Bahrain, and I discovered that there are a lot of people who don't know what is taking place in that country," the Chinese diplomat stated. "I believe that each person and each country should respect the legitimate rights of the Bahraini people, because they only aim at gaining freedom and living in dignity," he said. In addition, Jianhao said, "All nations in the world have the right to seek a better future, and I express sympathy with the Bahraini people." "Although it is not my field of expertise, but there are some organizations in China, mainly non-governmental organizations, that are concerned with human rights affairs, especially in the Middle East," he went on to say. It is not a matter of concern as much as it is a matter of acknowledging the situation and solving it. The people of Bahrain, Palestine, Iraq, Afghanistan, Sudan, Somalia, and other Arab countries are suffering the misfortune of having West-backed governments. The international community should wake up and realize the truth; people are suffering by the hands of the world's silence. The International Coalition against Impunity (HOKOK) condemned the terrorist attack that hit a Basic Education school in al-Malki neighborhood in Damascus city on Wednesday, killing a female teacher and injuring 23 students. HOKOK considers that this terrorist attack expresses the hatred of the terrorists towards the Syrians and their future. HOKOK condemns, as well, the international silence towards terrorist crimes and reiterates its call for the international community to fulfill its responsibilities in keeping international peace and security and to take the necessary measures to stop the flow of weapons and funding for the terrorist organizations; and thus avoid committing more crimes against civilians. 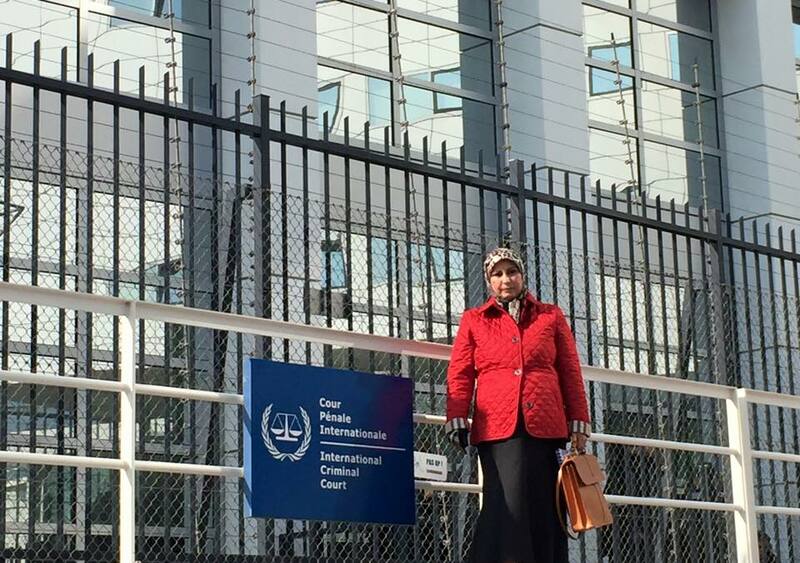 The lawyer May el-Khansa, president of the International Coalition against Impunity (HOKOK), met on Tuesday, March 17, 2015, with a number of ICC Court members in The Hague, over two hours, to discuss the complaints filed by HOKOK against a number of perpetrators of crimes against humanity in the Zionist entity. As well, HOKOK filed a new complaint backed up with names and photos against the Zionists, after formally recognizing the state of Palestine. ICC Court promised HOKOK president that it will do its legal job far from any political intervention to prosecute the Zionist war criminals for their crimes. ICAI/HOKOK condemns the terrorist bomb attacks in Yemen’s capital, Sana’a that killed at least 142 Yemeni Shi'a Muslims and injured more than 345 who did not commit any crime, except performing their prayers in the mosque. HOKOK considers that these attacks aim at inciting insecurity and instability in the country. The terrorist ISIS group that has adopted these bombings and others in Tunisia, Iraq, Yemen, and Syria is working to support the Zionists and international plans that seek to divide the Arab countries. Therefore, HOKOK calls on the Arab people to unite to preserve security and stability in the Arab world, to confront these gangs and to take all necessary measures to eliminate it and uncover the regimes supporting these gangs, either by money, weapons or other means. As well, HOKOK calls upon the international community and international organizations concerned with human rights to cooperate in order to sue criminals. After ICAI/HOKOK has filed a complaint before the International Criminal Court regarding the ongoing attacks on civilians and the widespread human rights abuses in CAR, and after it constantly urged the United Nations to investigate war crimes committed in the Central African Republic and prosecute perpetrators of such crimes in the war torn country, the United Nations Security Council members will visit today March 09, for the first time the Central African Republic to investigate these crimes. Therefore, HOKOK calls on them to denounce these attacks against civilians, including Muslims trapped and to remind all sides that those responsible for the crimes will be held to account, in addition to improving protection for civilians and ensuring justice for the brutal killings that have ravaged the country. The International Coalition against Impunity (HOKOK) deplores the murder of at least 10 people and injury of 30 others, on Tuesday, in a double blast in southeastern Baghdad by an explosive bomb and a car bomb, in the Jisr Diyala neighborhood on the southeastern edge of Baghdad. The so-called 'Islamic State of Iraq and the Levant' (ISIL) keeps on committing the most heinous massacres against all who disagree with it, and some Western and Arab countries keep on backing this terrorist organization with money and weapons to achieve their ends, at the sight of the international community. Recently, ISIL has kidnapped at least 90 Assyrian Christians in al-Hasakah province, northeast of Syria. The abduction took place after ISIL terrorists seized two Assyrian villages in the region, namely Tel Shamiram and Tel Hormuz. Hence, HOKOK condemns this terrorist act, as well as the burning of the "Tomb Sham" church, few kilometers far from the area. The International Coalition against Impunity (HOKOK) condemns the tragedy of slaughter of the Egyptian Copts by the criminal ISIS in Libya, stressing the need for the International community to perform their tasks and prosecute the extremist criminals and terrorists, bring them to justice and immediately punish them. HOKOK declares its solidarity with and support to the Egyptian people in its honorable battle against the terrorists, the enemies of God, of the country, of citizenship and of reconciliation, offering its deepest condolences to the Egyptian people and to the families of the victims of this cowardly terrorist act and praying they find patience and solace. The International Coalition against Impunity (HOKOK) considers the execution of Maaz al-Kassasbeh is a horrific criminal act added to the ISIL crime record. ICAI/HOKOK calls on the United Nations to take the necessary measures to put an end to the heinous crimes committed by these terrorist groups in different Arab countries, starting from car and suicide bomb attacks in civilian areas, summary executions, torture in detention, discrimination against women, destruction of religious property, to burning Maaz al-Kassasbeh alive. The International Coalition against Impunity (HOKOK) salutes the eight martyrs of the Lebanese army who were killed at the hands of the extremist terrorist gangs while they were defending Lebanon in Ras Baalbeck region. HOKOK salutes as well the Lebanese army for resisting the terrorists and combating heroically the terrorist organizations’ aggression over his sites and Lebanese territories. Moreover, it supports the Lebanese army in the issue of combating terrorism and sends its deep condolences to the military institution and their families, praying for the speedy recovery of the wounded. HOKOK calls on all political forces to give priority to the logic of wisdom and prudence and to make every effort to protect Lebanon. The International Coalition against Impunity (HOKOK) denounces all media attacks against the Prophet Muhammad (PBUH) and all the other prophets. It condemns as well the brutal terrorist attack that targeted the satirical newspaper "Charlie Hebdo" in Paris, on January 7, 2015, killing 12 people. HOKOK considers that the terrorist acts that affect innocent people contradict Islamic teachings. As well, ICAI/HOKOK stresses the need for all states to unify in order to fight terrorism because it affects everyone without exception. It expresses its warm condolences to the French government and the French people, confirming its solidarity with them in this tragedy, and its defense of the freedom of the press. HOKOK calls on the French authorities to review its policy towards the Middle East and the Muslim world and to bring to justice those responsible for this horrific attack. The International Coalition against Impunity (HOKOK) condemns the provocative actions of the Bahraini regime troops that assaulted and removed the Ashura symbols and summoned the orators during Ashura ceremonies on Tuesday, November 4, 2014. As well, the Bahraini regime troops continued assaulting Ashura symbols, including flags, slogans, and other items which are used by Shia to mark the anniversary in the different cities. HOKOK stresses that these assaults are part of the existing regime policy based on sectarian and religious discrimination against an essential component of the Bahraini people, and a part of the policy of demolition of mosques and Husseiniat carried out by the authorities since the start of the revolution in February 2011. HOKOK warns the Bahraini authorities against these terrorist actions and stressed that the religious rites are stipulated in the Bahraini constitution, as the article 311 of the Bahraini penal code states that a punishment shall be inflicted upon any person who deliberately causes disturbance to the holding of religious rituals by a recognized sect, or to a religious ceremony or meeting or obstructing such events or preventing the holding thereof with the use of force or threat and any person who destroys, damages or desecrates a place of worship of a recognized sect. As well, article 18 states that everyone has the right to freedom of thought, conscience and religion; this right includes freedom to change his religion or belief, and freedom, to manifest his religion or belief in teaching, practice, worship and observance. The International Coalition against Impunity (HOKOK) raises the voice against vandalism and violence in Turkey, calling for common sense after the recent wave of unrest that has left 31 people dead and many more injured across the country. The use of violence by the Turkish security forces against pro-Kurdish protests continues as the Turkish Interior Minister said that at least 31 people have been killed and 360 others injured in four days of protests in Turkey led by pro-Kurdish demonstrators against the government's policy on Syria. As well, over 1,000 people were detained for their involvement in the protests. The International Coalition against Impunity (HOKOK) denounces the arrest of the Secretary General of Al-Wefaq Islamic Association, Sheikh Ali Salman, by the Bahraini regime authorities because he had practiced his right to freedom of expression. HOKOK considers that the detention is meant to stifle free speech and political freedoms in Bahrain. Sheikh Salman is known to be a political and national figure that has always called for dialogue and peaceful procedures. Therefore, ICAI warns that the opposition leader’s arrest is a dangerous escalation and calls on the government to release him immediately. HOKOK stresses the need to support Sheikh Salman in all his rightful and human positions, and supports the peaceful popular demonstrations held by the Bahraini people to condemn his arrest. ICAI/HOKOK is one of the main supporters of the Bahraini people through the lawsuits it filed against the ruling Al-Khalifa regime before the International Criminal Court in The Hague and the European Court of Human Rights in Strasbourg due to the repressive actions against demonstrators in the country and the crimes committed by this regime against its people and the freedom of expression, in addition to the solidarity protests organized by HOKOK for the benefit of the Bahraini people in The Hague and Geneva, as well as the protest in New York held after sending a letter to the Secretary-General of the United Nations Ban Ki-moon and visiting a number of international organizations to urge them to support the Bahraini people. The International Coalition against Impunity (HOKOK) condemns the death penalty imposed by the Saudi authorities against Ayatollah Sheikh Nimr Baqer al-Nimr, a symbol of the peaceful revolution that request Saudi people’s rights, specifically citizens’ right to elect their rulers. HOKOK considers that this sentence issued by Saudi Arabia seeks to ignite sectarian strife by all means for inhuman and immoral purposes. HOKOK shows full solidarity with Sheikh Nimr al-Nimr, and calls on releasing him. It also considers the death penalty against him as a politicized unfair and unjust sentence violating rights and freedoms, in the absence of democracy, freedom and human rights in this country whose principles and laws are based on dictatorship, murder, and oppression. ICAI/HOKOK warns KSA authorities from executing Sheikh Nimr al-Nimr because this arbitrary and risky sentence will increase tensions in the region. The International Coalition against Impunity (HOKOK) condemns Wednesday’s double terrorist blast outside Akrameh al-Makhzoumi primary school in Homs city in central Syria, which killed at least 45 people, including 41 children between the ages of six and nine. HOKOK urges the international community to put an end to these horrific massacres committed by the terrorist groups in Syria; particularly, IS and Jabhat el-Nusra. The International Coalition against Impunity (HOKOK) condemns the US missile strikes on Syria that killed civilians, violating the laws of war by failing to discriminate between combatants and civilians. For instance, on September 23, a series of US missiles struck houses in Kfar Deryan in Syria, killing at least 8 children, 5 women and 2 men, and injuring 15 others, including women and children. Therefore, these strikes are unlawful under the laws of war. HOKOK calls on the United Nations to investigate illegal US strikes that kill civilians. The International Coalition against Impunity (HOKOK) highly condemns the series of atta/cks by armed groups on unarmed civilians in Assam, India, that has led to the death of at least 50 people and serious injuries to several others. HOKOK calls on the authorities to step up security for civilians and bring the perpetrators to justice, considering that it is the fundamental right of every person to live free from violence and discrimination and the authorities in Assam must take action to protect the rights of all communities and bring those responsible for the attacks to justice. The International Coalition against Impunity denounces the torture of detainees by the Central Intelligence Agency’s (CIA), stating that it violates human rights. As well, HOKOK strongly condemns the report issued by the US Senate Intelligence Committee stressing that torture is legitimate and legally based on Israeli precedents regarding torture of its detainees. In this context, ICAI/HOKOK calls on the United Nations to act immediately to stop violations of International Laws and the Charter of Human Rights, especially that the USA relied on the Zionist State, which violates the Palestinian territories and murders innocent people, to justify the torture by its own intelligence agencies. The International Coalition against Impunity (HOKOK) condemns the heinous crime committed lately in Showeika neighborhood in al-Qatif in Saudi Arabia, where the Saudi authorities used live bullets to disperse a peaceful protest organized in support of arrested cleric Sheikh Nimr al-Nimr, resulting in the injury of about ten protesters and the death of Bassem al-Qadihi who succumbed to his injuries. The International Coalition against Impunity (HOKOK) condemns the use of violence by the Turkish security forces against pro-Kurdish protests yesterday, leading to the death of 3 protesters who were expressing their support for the Syrian border city of Kobani, and denouncing Ankara’s failure to intervene militarily to save this city threatened to fall in the hands of ISIS, disclosing the rollback of human rights and rule of law in Turkey, revealed by the government’s repressive reflexes with the crackdown on protests in Istanbul and other cities in 2013, involving excessive use of force by the police, including the misuse of teargas. The International Coalition against Impunity (HOKOK) condemns the murder of Badr Eid, who is the brother of former MP Ali Eid, in the town of Kwaykhat, by terrorist gangs in an attempt to fuel strife and sow seeds of discord among Lebanese people and destabilize the country. HOKOK calls on the concerned authorities to pursue the criminals and impose the most severe sanctions against them. The International Coalition against Impunity (HOKOK) will hold a protest rally to support the Palestinian people in the legal process for the prosecution of the Zionist entity against the crimes it committed, on March 17th, from 12:00 PM till 02:00 PM, before ICC Court in The Hague. It’s worth mentioning that HOKOK is the first organization that filed, before the International Criminal Court in The Hague, a complaint against the Zionist entity registered under the number OTP-CR-4425/08; this complaint was followed by a number of complaints, most recently the complaint dated on 18/07/2014, and registered under the number OTP- CR-223/14. Moreover, a number of HOKOK’s members will meet with the Court’s members during the demonstrators’ gathering before the ICC Court. Note: Those wishing to participate in this protest, please send us your name and phone number via the following e-mail: icaihokok1@gmail.com, or HOKOK website www.icaihokongo.com. ICAI/HOKOK will provide participants with maps that show roads protected from the Dutch police and which can be followed during the protest. The International Coalition against Impunity (HOKOK) praised the initial deal reached, in the Swiss city of Lausanne, between the six world powers and the Islamic Republic of Iran which has the right to possess peaceful nuclear energy. HOKOK said this deal has confirmed that the European countries are totally convinced that the Islamic Republic of Iran respects its words and has a serious intention to peacefully cooperate with the Western world. The International Coalition against Impunity (HOKOK) called on the United States of America to end crackdown on the freedom of opinion and give the American people the chance to express their opinions through demonstrations. HOKOK appeals to the US administration to prosecute those responsible for the repression of freedoms after almost 185 protesters were arrested during a peaceful demonstration in Los Angeles. It also called for the protection of minorities and non-discrimination between citizens, especially by favoring white people over black or Middle Eastern people. HOKOK commends the position of the UN Secretary-General Ban Ki-moon for denouncing the crackdown on the freedoms in the United States. ICAI/HOKOK strongly denounces the two suicide car bombs exploded at an army headquarters, by the terrorist Al-Qaeda, in south Yemen today, killing six people and injuring dozens. HOKOK also denounces the explosion in a square in Seiyun near a local government building, calling on the United Nations to take the necessary measures to stop these crimes committed by these terrorist groups in different Arab countries, especially Syria, Iraq, Lebanon, etc. The International Coalition against Impunity (HOKOK) strongly condemns the terrorist attack on a gathering of Shia worshippers mourning the martyrdom anniversary of Imam Hussein (PBUH) in Ihsa’a region in Saudi Arabia. At least 7 persons were reported killed and dozens injured in latest attacks on Shia mourners on Ashura Tuesday. HOKOK calls on the United Nations to ensure security for people attending religious ceremonies in accordance with the intentional laws and identify and punish elements behind the terrorist attack in the country. HOKOK condemns as well the Saudi court for handing down, on Monday, long jail terms to three anti-regime activists as the kingdom continues its crackdown on dissent, calling on the Saudi authorities to release political prisoners and to end discrimination against minority Shia Muslims, and to stop using excessive force against the protesters. The International Coalition against Impunity (HOKOK) denounces the torture, abuse and suffer endured by Kurdish children from the Syrian city of Kobani (Ain al-`Arab) while detained by Islamic State (ISIS). The children, aged 14 to 16, were among 250 Kurdish students whom ISIS abducted on May 29, 2014, as they traveled home to Kobani. They were enduring repeated beatings with a hose and electric cable, as well as being forced to watch videos of ISIS beheadings and attacks. ICAI/HOKOK considers that taking hostages is a war crime under international humanitarian law (the laws of armed conflict). The war crime of torture, under international humanitarian law, is the infliction of severe physical or mental pain or suffering for purposes such as obtaining information or a confession, punishment, intimidation, or coercion, calling on the United Nations to take national measures to stop the flow of foreign fighters, financing, and arms to ISIS, Jabhat al-Nusra, and any other individual or group associated with al-Qaida. The International Coalition against Impunity (HOKOK) calls on the Kingdom of Saudi Arabia to end the arbitrary detention, especially Fadi Musallam, 27, a Jordanian mathematics professor arrested in March 2014 but not charged. HOKOK calls on the Saudi authorities to immediately release Musallam, as there are no charges against him. Musallam was arrested on March 7, 2014, during a visit to the Haram Mosque in Mecca, as a police officer told him he could not take pictures inside the mosque, the authorities took him to Dhahban Prison, outside Jeddah, where he remained for 59 days without being allowed to contact his family members or see a lawyer. Musallam has been in detention without charge for almost 200 days. The International Coalition against Impunity (HOKOK) condemns the Lebanese government’s silence over the death of Fawaz Bazzi from the wounds he sustained after being shot at by known assailants in Tripoli's Bab al-Tabbaneh neighborhood. HOKOK considers that failing to pursue the terrorists who killed Fawaz Bazzi and holding them to account, will sow discord among Lebanese people. The International Coalition against Impunity (HOKOK) confirms that the summary killing of Lebanese soldier Abbas Medlej, aged 20, on 6 September, and Lebanese army sergeant Ali al-Sayed, aged 28, on 28 August, by Islamic State (IS) and Jabhat al-Nusra (JN) terrorists, as a war crime for which Turkey and Qatar must bear ultimate responsibility. HOKOK also stressed the need to compel Qatar and Turkey to make pressure on Islamic State and Jabhat al-Nusra terrorists to release all hostages immediately, and to ensure that the kidnapped soldiers and Internal Security Forces are treated, first, in accordance with the Islamic law; as those terrorists allege they are applying Islamic beliefs, and then pursuant to Lebanese and International laws. HOKOK called upon the Lebanese government to seek help from the United Nations to form an international tribunal similar to that of the Martyr Hariri, in the presence of countries complicit in these crimes, such as Turkey and Qatar, and this to preserve the soldiers’ dignity and rights. The International Coalition against Impunity (HOKOK) condemns what happens in Mali as the children pay a high price in ongoing conflict. Since the beginning of the conflict in January 2012, children have been recruited to fight by both pro-government militias and armed opposition groups. A number of children suspected of belonging to armed groups have been arrested by the Malian authorities and are now being held in detention in both the Bamako civil prison and the Bamako gendarmerie Camp I. They receive no access to lawyers in detention or family visits. ICAI/HOKOK calls on all parties to the conflict to put an end to ongoing human rights violations and for a prompt investigation into all crimes committed against international law and pursuing criminals. Raif Badawi was arrested on June 17, 2012 in Jeddah. The criminal court in Jeddah has charged him with the violation of Saudi Arabia’s IT law through creating and running a public forum for discussion on the internet titled “Saudi Arabian Liberals” website. He was also charged with insulting religious symbols on Twitter and Facebook, as well as criticizing the religious police in KSA and officials calling for gender segregation in the Shura Council. Raif was sentenced to ten years in prison and 600 lashes and the online forum was ordered to be closed. In this regard, ICAI/HOKOK is calling on the Saudi Arabia authorities to release Raif Badawi immediately and unconditionally as he is a prisoner of conscience, detained solely for exercising his right to freedom of expression and urges them not to carry out any punishment which would violate the human rights related to freedom of thought, conscience and belief. A number of lawyers, members of the International Coalition against Impunity (HOKOK), moved, on Thursday 08/14/2014, to The Hague after taking an appointment with the Office of the prosecutor at the International Criminal Court to discuss the complaint filed by HOKOK against the Zionist entity and the governments of UK, US and Italy for committing genocide, war crimes and crimes against humanity. The complaint includes a large number of martyr and wounded names, in addition to new information confirming that the court has jurisdiction over this case. The ambience was very positive and the organization was promised to receive a letter from the Court including the decision of the Prosecutor regarding the mechanism of the investigations and the decision that will be taken in terms of pursuing the Zionist entity. The International Coalition against Impunity has warned the Qatari authorities of allowing U.S. aircrafts to take off from Arab Qatari lands, especially that these aircrafts are carrying lethal bombs labeled (smart bombs) and delivering them to the Zionist army; if not, Qatar will be considered as co-conspirator in the crimes of genocide and war crimes; as well, its name will be added to the defendants in the complaint filed before the international Criminal Court in The Hague and recorded on July 18, 2014 with no. 14/223. This step will be in the scope of the legal campaign carried out by our international organization to condemn the perpetrators of the massacres, impose a cease-fire in Gaza, and guarantee not sending arms to the Zionist entity that commits genocide against defenseless people. HOKOK’s chief, the attorney-at-law May El Khansa, affirms that the organization will pursue every perpetrator or co-conspirator, whether Zionist, Arabic, European, or of whatever nationality before the ICC COURT in The Hague and a large number of courts that have jurisdiction over such crimes, including the court in the United States as their sentences and crime are one and similar to those of Zionists. HOKOK’s Chief confirms that all countries arming the Zionist entity and facilitate their access to weapons are complicit in the murder of civilians and in committing massacres, genocide and war crimes, including the United States, which hold the primary responsibility for these massacres as it is the main weapon supplier of the Zionist army, in violation to international law and international treaties. The International Coalition Against Impunity (HOKOK) will hold on Saturday, August 9, 2014 a protest in front of the Israeli Consulate in Barcelona, at noon, to deplore the crimes committed by the Zionist enemy in the Gaza Strip and to confirm the intention of HOKOK to prosecute the Zionist entity pursuant to the complaint that the organization has filed before the International Criminal Court in The Hague on July 18, 2014, registered with the number OTP-CR-223/14. ICAI/HOKOK calls on all Gaza supporters to assemble in front of the Israeli consulate in Barcelona to raise the voice to prosecute the perpetrators of crimes in Gaza and lift the siege of Gaza. On June 02, 2014, ICAI /HOKOK has deplored the Bahraini authority policies which continue in the persecution of the Shiite community in different ways. After the demolition of 35 Shia mosques during the declaration of a state of emergency, the government of Bahrain has revoked the citizenship of 31 Shiites. As well, the court has issued a ruling to dissolve the Islamic Scholars Council and liquidate its assets, which is a clear violation of religious freedoms. On May 29, 2014, ICAI/HOKOK has praised highly the free and honest presidential elections that took place in Egypt, considering it as an important step towards the implementation of human rights principles stipulated in the international conventions and international laws. On May 14, 2014 ICAI/HOKOK has expressed its utmost concern for the extra judicial killing of a fourteen year old boy called Sayed Mahmoud Sayed Mohsen Sayed Ahmad, by the Bahraini security forces after they attacked the funeral procession, in which Sayed Mahmoud Sayed Mohsen was participating, using shotgun pellets and tear gas. June 11, 2014 - The International Coalition against Impunity (HOKOK) welcomes the joint statement regarding human rights in Bahrain, presented by Switzerland, on behalf of a cross-regional coalition of 46 countries. The statement cites a list of grave concerns including the continued ill-treatment and torture of detainees in police custody, the repression of demonstrations, the failure to guarantee fair trials, the harassment and imprisonment of human rights defenders and journalists, the increased restrictions of the freedoms of peaceful assembly and association, the stripping of citizenship from activists and the lack of accountability for human rights violations. HOKOK joins these States in urging the government of Bahrain to release all prisoners detained for exercising their human rights. June 05, 2014 - The International Coalition against Impunity (HOKOK) denounces the arrest of Firas Al-Saffar, a 15 year old student, from his home early in the morning, on June 1, 2014, before going to school, by members of the security forces, because of “filming unauthorized gatherings”. ICAI/HOKOK calls on the United Nations to put pressure on Bahraini authorities to release Firas Al-Saffar and all detained children in the Bahraini prisons. June 23, 2014 - ICAI/HOKOK calls upon the United Nations to prevent terrorist armed groups in Syria from using children as young as 15 to fight in battles and to hold accountable governments supporting these armed groups and therefore committing war crimes. HOKOK indicts these extremist groups, including Jabhat al-Nusra and Daesh, for recruiting children through free schooling campaigns that include weapons training, and giving them dangerous tasks, including suicide bombing missions. June 24, 2014 - ICAI/HOKOK condemns the suicide bombing that took place around midnight Tuesday in the Tayouneh area, in Lebanon. It is a cowardly terrorist act that the states sponsoring terrorism and funding it with money and weapons shall bear responsibility. HOKOK considers that this heinous crime committed by Takfirists is a part of the Takfiri terrorism against the Arab and Muslim world, which is clearly witnessed today in Syria and Iraq. In fact, these crimes serve only the Zionist enemy and his plans to destabilize the security and stability in Lebanon and the region. HOKOK offers its condolences to the family of the martyr, in the General Security, Abdul Kareem Hodroj who saved the region from an inevitable massacre and wishes the wounded a speedy recovery. The International Coalition against Impunity (HOKOK) condemns in strongest terms the heinous crime committed by the Zionist terrorism against the 16-year-old boy Mohammed Hussein Abu Khdeir who was kidnapped by the Zionists in front of his house in Shuafat; they tortured and killed him and burnt his body, and then threw him in jungles near the village of Deir Yassin. HOKOK calls on the UN to form a committee to investigate this brutal crime and bring the perpetrators and criminals to trial. Due to the gruesome crimes committed by the Zionist entity government and its people in the Occupied Palestine, which are crimes against humanity punishable under international criminal law, ICAI/HOKOK condemns the crimes committed against the Palestinian people and finds strange the international silence. HOKOK calls on the UN Secretary-General, Mr. Ban Ki-moon, to take the appropriate measures to stop this brutal aggression. Based on the vow taken by the Palestinian President Mahmoud Abbas on Monday 06/07/2014 on the prosecution of the Zionist entity, the International Coalition against Impunity (HOKOK) sent him a letter on Tuesday 08/07/2014 wishing that he lodges a motion before the International Criminal Court pursuant to paragraph /3/ of Article 12 of the Court’s Statute to investigate the crimes committed against the Palestinian people in order to start the investigation in the earlier complaint filed against the Zionist entity and the complaint that will be filed in the coming days. It’s worth mentioning that ICAI/ HOKOK has filed, in 2008, a complaint against the Zionist entity, before the International Criminal Court in The Hague on 10/12/2008, registered under the number OTP-CR-4425/08. The Court’s Director Ms. Beatrice Le Frapper Du Hellen has informed the organization, in April 2009, that the complaint had been accepted as it complies with the terms of the Court that will investigate with Israeli officials as a result of their crimes, especially that the Palestinian Government has sent in that year a letter asking the court to make its investigations; however, as a result of taking back its demand, the lawsuit has been frozen again. July 11, 2014 - The International Coalition against Impunity (HOKOK) strongly condemns the brutal assault against the Palestinian people and calls on the weak Arab and Islamic countries to show solidarity with the Palestinian people to stop the bloodshed as the Zionist enemy goes to extremes in killing the children, the women and the elders in Palestine during this holy month. HOKOK also calls on the international community to assume its responsibilities and take the necessary measures towards this unarmed people in these circumstances and to lift the siege of the Palestinian people and Gaza. July 11, 2014 - The International Coalition against Impunity (HOKOK) denounces the attacks against Shia Muslims in Turkey where their mosques are being burnt in public, and it calls on the concerned persons to assume their responsibilities and pursue the doers and protect the citizens and the worship houses in the country. 17/08/2014 - A number of European lawyers, members of the International Coalition against Impunity (HOKOK) will move to The Hague according to an appointment with the ICC Court in La Haye to lodge a complaint against the Zionist entity, members of its government and some of the Israeli military leaders, in addition to some of the British government members and the US President for committing genocide, crimes against humanity and war crimes against the Palestinian people in general and the people of Gaza in particular. ICAI/HOKOK will be at the Court on Friday, July 18, 2014, at 3:00 PM. It calls on all local and international human rights’ organizations to defend the people of Gaza by filing more complaints before the International Criminal Court and other international courts having jurisdiction over such case. ICAI/HOKOK calls on the united Nations and all medical humanitarian organizations, such as the “International Committee of the Red Cross” and “Doctors Without Borders” to move immediately to Gaza to do their humanitarian duty; otherwise they are accomplices in the crimes of murder and genocide committed in Gaza. 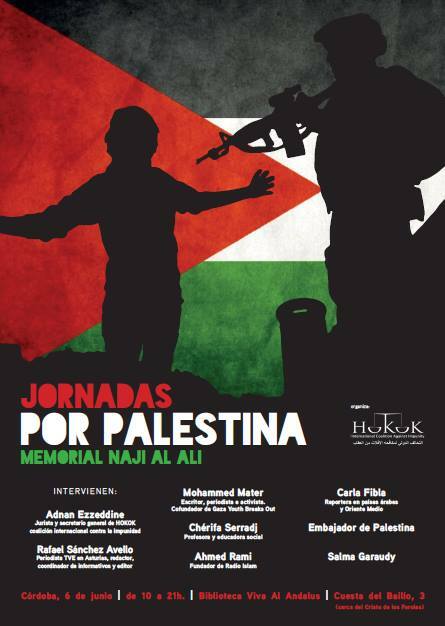 ABOGADOS EUROPEOS MIEMBROS DE LA ORGANIZACIÓN “HOKOK” COALICIÓN INTERNACIONAL CONTRA LA IMPUNIDAD, PRESENTARÁN EN EL DÍA 18 DE JULIO DE 2014 ANTE EL TRIBUNAL PENAL INTERNACIONAL EN LAHAYA UNA DEMANDA CONTRA EL ESTADO SIONISTA DE ISRAEL, Y LOS MIEMBROS DE SU GOBIERNO Y SUS LIDERES MILITARES, Y LA ACUSACIÓN A LOS GOBIERNOS BRITANICOS Y AL PRESIDENTE DE ESTADOS UNIDOS POR EL APOYO MILITAR Y LÓGISTICOS PARA QUE ISRAEL COMETE SUS CRIMENES CONTRA EL PUEBLO PALESTINO., QUE SON CRIMINES CONTRA LA HUMANIDAD Y GENOCIDIO CONTRA EL PUEBLO PALESTINO EN GAZA., LA DEMANDA ESTÁ BASADA AL ESTATUTO DE ROMA ADOPTADO POR LAS CONVENCIONES INTERNACIONALES. ES COMPETENCIA DEL TRIBUNAL PENAL INTERNACIONAL DE LAHAYA INVESTIGAR ESTOS CRIMINES Y SENTENCIAR A LOS AUTORES DE ESTE GENOCIDIO CONTRA EL PUEBLO PALESTINA MÁS AUN QUE NACIONES UNIDAS HAN RECONOCIDO AL ESTADO PALESTINO Y SE PROCLAMÓ EL ESTADO PALESTINO. ADEMÁS EL PRESIDENTE DEL ESTADO PALESTINA MAHMOUD ABBAS DEMOSTRÓ SU VOLUNTAD DE DENUNCIAR ANTE LA CORTE PENAL EN LAHAYA ESTOS CRIMINES CONTRA EL PUEBLO PALESTINO PARA LA APERTURA DE LA INVESTIGACIÓN DE ESTOS CRIMINES. “HOKOK” COALICIÓN INTERNACIONAL CONTRA LA IMPUNIDAD LLAMA A TODAS LAS ORGANIZACIÓNES HUMANITARIOS A DIRGIRSE A GAZA APORTANDO LOS APOYOS MATERIALES COMO LA MEDICINA, Y LAS COMIDAS, ES UN DEBER ANTE LA SITUACIÓN DEL PUEBLO PALESTINO EN GAZA. Accusations of severe violations of the laws of war have been clear during the Israeli offensive in Gaza due to the crimes committed by the Israeli military. Therefore, the International Coalition against Impunity (HOKOK), have lodged a complaint with number OTP-CR-223/14 before the International Criminal Court on July 18, 2014. As organization having experience of international justice, we believe there must be an international investigation of gross violations of the laws of war, committed by Israel; therefore, the international community must conduct a quick, independent and impartial investigation that provide all the gross violations of international humanitarian law committed by Israel and provide recommendations on how those responsible for crimes should be held to account. Especially that previously a well-known Israeli politician and parliament member, named Ayelet Shaked, has branded Palestinians as terrorists, saying mothers of all Palestinians should also be killed during the ongoing Israeli assault on the besieged Gaza Strip. She called for the slaughter of Palestinian mothers who give birth to "little snakes", adding: “They have to die and their houses should be demolished so that they cannot bear any more terrorists. They are all our enemies and their blood should be on our hands.” The remarks are considered as a call for genocide as she declared that all Palestinians are Israel's enemies and must be killed. We have seen the importance of investigating the truth and bringing justice for the Palestinian victims and believe it is a precondition to move forward and achieve peace in the Middle East. The world must demand respect for the Palestinians and investigate and condemn the Israeli violations. We call on world leaders to clarify that the targeting of civilians during conflict is unacceptable and to support the establishment of a United Nations commission of inquiry into the conflict against Gaza acting in accordance with the international standards governing such investigations. The International Coalition against Impunity (HOKOK) denounces the shelling of Sinjar, west of Mosul, by Daesh terrorists, on Sunday August 3, 2014, causing the death of more than a thousand Yazidis, most of whom were killed after carrying out mass executions, the death of 70 children due to hunger, thirst and extreme heat, and the abduction of 500 girls whose fate is still unknown and 100 families who were taken to Al-Jazira area in Mosul and whose fate is still unknown too. HOKOK stresses the crimes committed in Sinjar are genocide pursuant to 1948 Convention on the Prevention and Punishment of the Crime of Genocide and the articles 6 and 7 of the Rome Statute. HOKOK calls on the United Nations and the international community to act immediately and open investigations in these terrorist crimes targeting Iraqis.